Welcome to Cover Girl. Each month, we gather a team of WWAC contributors to analyze a new and notable comic book cover featuring one or more women. 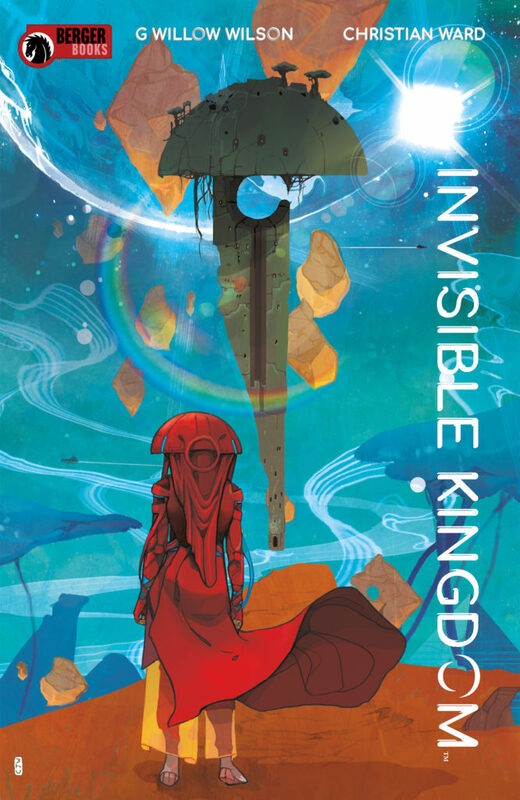 This month, Claire, Louis, Nola, and Wendy discuss Christian Ward’s cover for G. Willow Wilson’s Invisible Kingdom from Dark Horse Comics’ Berger Books. Louis Skye: My exact reaction cannot be described in words, so let’s go with “Huh?” What am I seeing here exactly, and what does it all mean? I am not a fan, I’m afraid. Wendy Browne: First of all, I really love the colour combination of warm reds and cool aquas, and I appreciate that affirmation of my recent decor choices. As to it being a piece of comics art, to me, it is a glorious example of the fact that comics are indeed art. I appreciate the way Ward’s work pushes the medium beyond the panels. 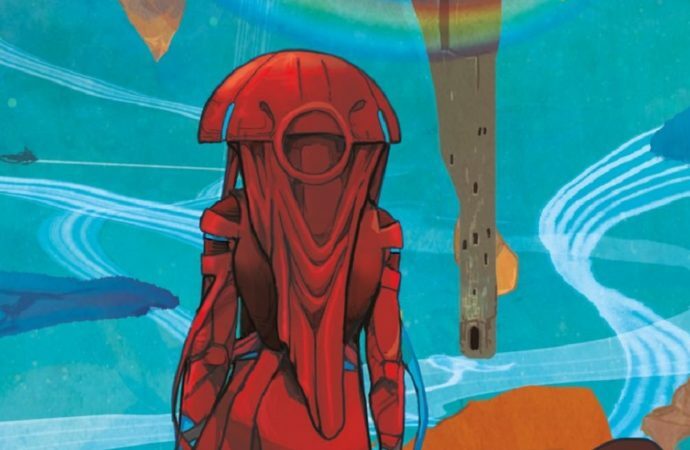 Nola Pfau: I’ll confess to start that I’m coming into this with a little bias, because I unreservedly love Christian Ward’s art (there is a specific page from ODY-C that I want so badly). Claire’s right that it wears the heart of European comics on its sleeve, and I’m for that. This looks like the start of an adventure. We’re behind her, she’s going to lead us somewhere. There’s a significant similarity between the floating (?) structure and the shape of her helmet that suggests a kind of design unity in whatever this civilization is, and I want to know more about it. Louis: It’s all space-things in one cover—mega space-stations; lens flare; a lone warrior; a doomed planet/galaxy; dystopia. Nola: It’s the start of something; I think Ward is conveying that effectively. The sky is open, so is the path ahead. She’s ready to travel. The space station thing is … fungal in nature, something that’s emphasized by the growth atop it; whether those are themselves mushrooms or some kind of canopy tree isn’t really clear, but it suggests these people take their design cues from the growth around them. Wendy: Agreed, Nola! I love the way her right foot is raised just so slightly, as if there is some hesitation, perhaps fear, but she will press forward. What does her attire make you think about this woman’s culture, environment, role, dreams, etc.? Louis: She looks like a red Ewok. Or does she look like a Space Handmaiden? I can’t decide. From the head-gear, I’m thinking there’s some Asian influences in this book, though the character will most likely not be Asian. The long, willowy robe makes me think she’s a scavenger, or someone at the bottom of the food chain. She has lofty ideals, but is crushed by society, so she looks to the stars, and that mega-station in space, dreaming of a better future for herself. Nola: It’s desert gear. A large helmet to block the sun and protect against sunstroke, breathable robes to protect the skin, but keep from overheating at the same time. I’m not certain whether she’s a scavenger or not, but the gear speaks less to cultural repression to me and more to the idea that she’s a person who gets things done. She’s got places to go and things to do. Invisible kingdoms to find (wait for a sandstorm, is my advice, at least it’ll be outlined, then). Wendy: Louis makes an interesting observation about the Space Handmaiden! I had not considered that, but given the influence The Handmaid’s Tale has had and its recent revival, the perception certainly makes sense, though I imagine that is not where this story is going. Otherwise, agree with Nola that her attire looks both practical, in terms of her environment, while serving as an expression of her culture in its intricate folds and lines. The way the design mimics the space station makes me wonder at the facility’s significance to this woman and to her people. The station looks human-made but it also has an organic feel to it. Perhaps it has become an object of worship to those who view it from a distance. Invisible Kingdom #1 will be available on March 20, 2019.